Glary Track Eraser is a handy piece of software developed by the makers of Glary Utilities, helps you in deleting all your activities on your PC, including cookies, click history, run menu, browsing history and more. The program also deletes the temporary files stored in your PC and free’s up the space on your hard drive. It scans the computer thoroughly and brings out a list of all temporary and unwanted files, your browsing history, files in your recycle bin, and log files of Windows apps. Although it removes temporary files, its focus is on cleaning out tracks left by the user. With the ever-increasing number of data theft and user behavior tracking attempts, privacy protection has become a major concern of both companies and individual users. Getting rid of computer activity records takes a lot of time, but fortunately there are applications that can assist you in this matter. One of them is suggestively called Glary Tracks Eraser. Glary Tracks Eraser makes it easy for you to delete all traces of your activity, including browser history and cookies, so as to protect your identity and prevent tracking. Not only that your privacy is safeguarded, but you also gain a significant amount of storage space, previously occupied by temporary or unneeded files. Relying on a robust scanning engine, Glary Tracks Eraser can analyze important areas of your computer in order to detect unnecessary files, displaying all its findings in an organized manner. It retrieves recently accessed documents, start menu items, a list of performed searches that Windows remembers, items stored in the clipboard, temporary files and Recycle Bin content. With just a click, you can get rid of these items. Aside from junk files created in Windows, Glary Tracks Eraser can also search for unneeded files created by popular Internet browsers. Thus, you can use it to remove the browsing history, cookies, fill-in form information, Index.dat and temporary Internet files. Its functionality is not limited to Windows and browsers only, as it provides compatibility with several applications, such as Windows Media Player, Flash Player, Wordpad, RegEdit and Windows Defender, enabling you to easily erase playback, document and action logs. 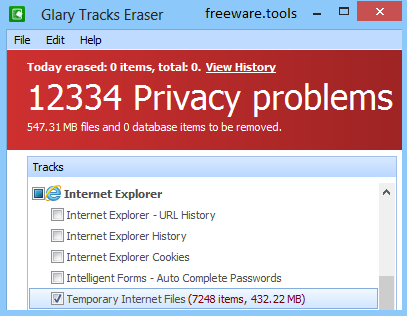 Glary Tracks Eraser has two main benefits: it enables you to secure your privacy and helps you free up disk space. Traces of your past actions can be deleted with just a few clicks, leaving no footprints for others to discover. With a user-friendly interface and intuitive controls, Glary Tracks Eraser is capable of deleting commonly generated computing and Internet browsing traces, ultimately aiming to protect your privacy and data.